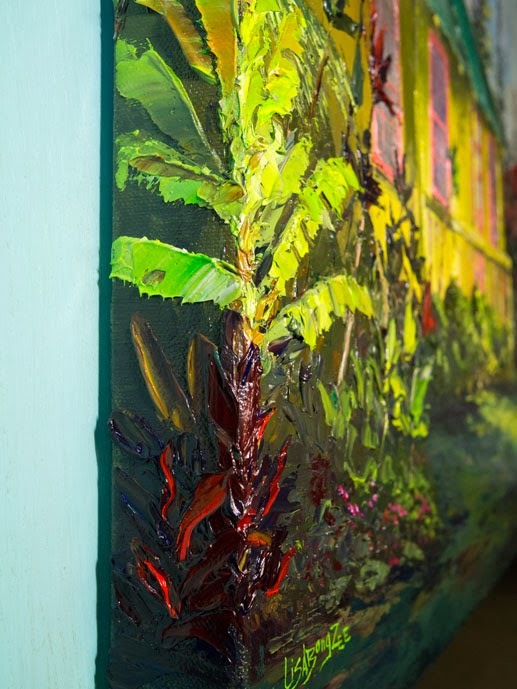 After a month in the “Xterra Dryer Rack” my large Plantation House palette knife painting is finally dry and ready to go. This is a scene of Koele Street on the island of Lana'i. 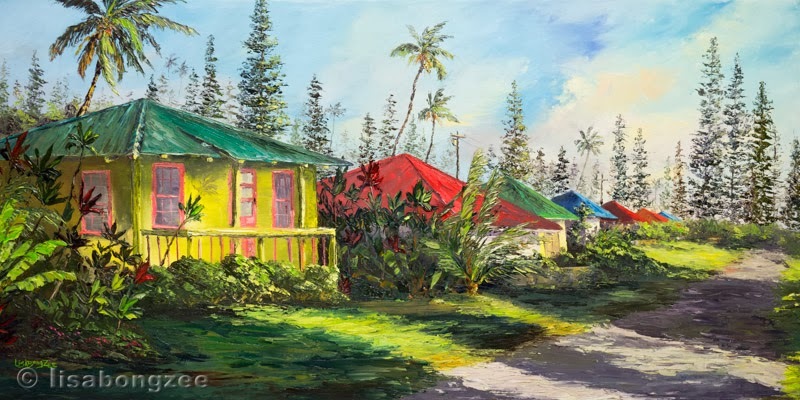 In the late afternoon, the sun casts long shadows across the landscape, with just enough light to make the little plantation hales glow with even more color than they already have! 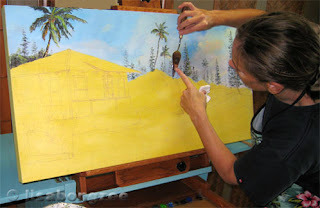 Below are some photos of the painting in progress. 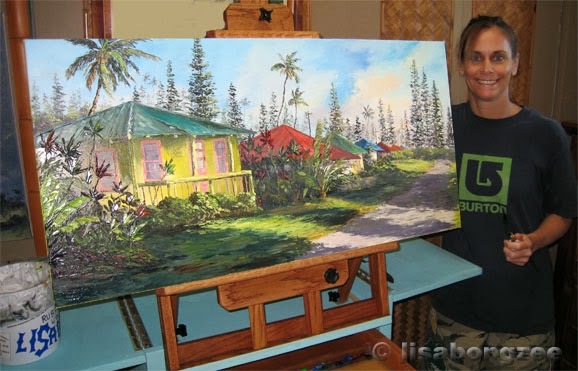 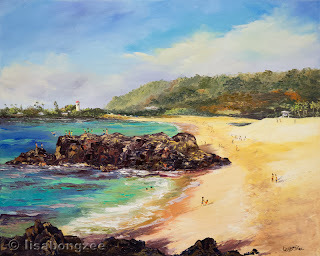 I had never painted Cook Island Pines until visiting Lana'i. One more hale to go! 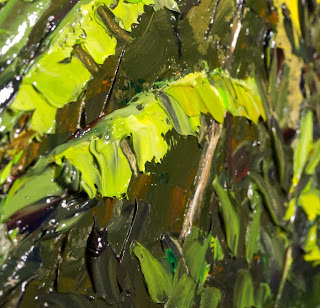 I decided to go crazy with the foliage, making it THICK AND JUICY (which is why the painting took so long to dry). 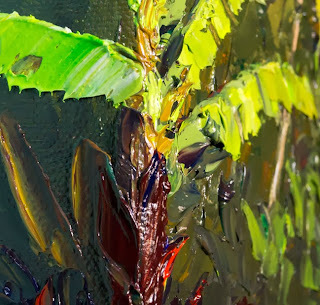 Ooey Gooey Banana and Ti leaf! Life is too short not to have FUN! 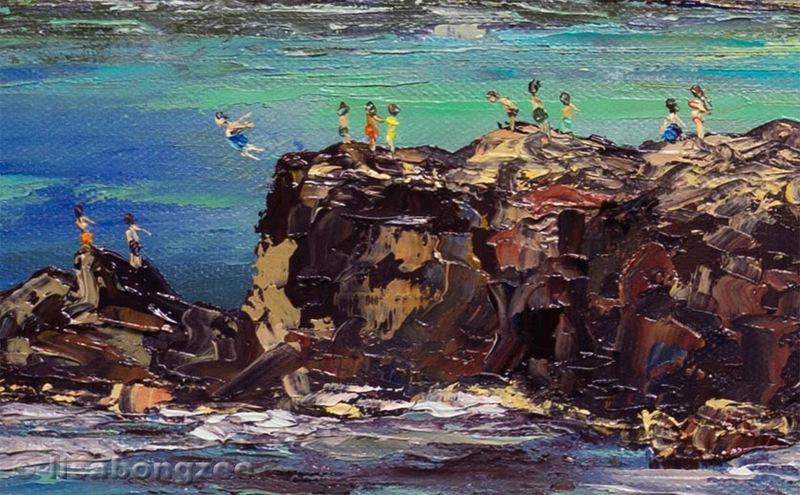 Jump Rock, on a calm Waimea Bay day, is the perfect place for some Island fun cliff diving! 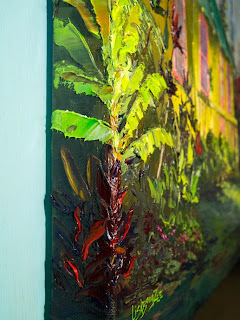 I live in a VERY small space, which is why I rarely paint large. 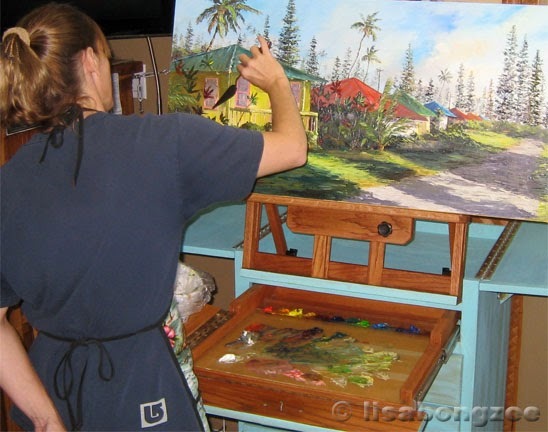 Having a place to allow a big painting to dry undisturbed was just not an option, until now…. I present my newly improvised “large painting drying rack” also known as the “back of my truck”. 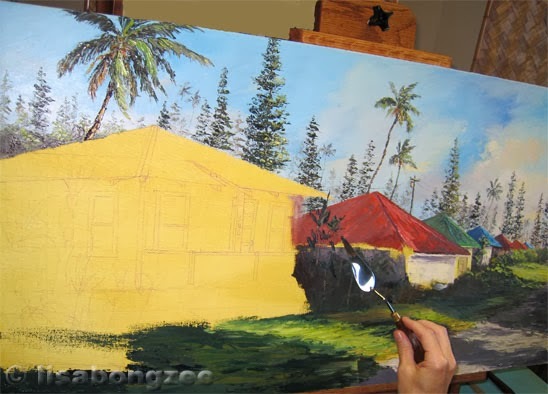 It gives me the extra needed space to paint larger, to paint thick and heavy with my knife, to not care if it takes weeks or even months to dry. It works well keeping the painting safe and free from dirt and dust, or getting bumped into or knocked over. 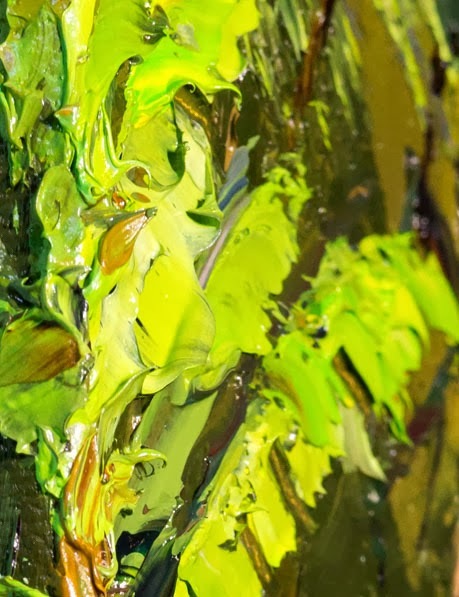 There are a couple of drawbacks though. 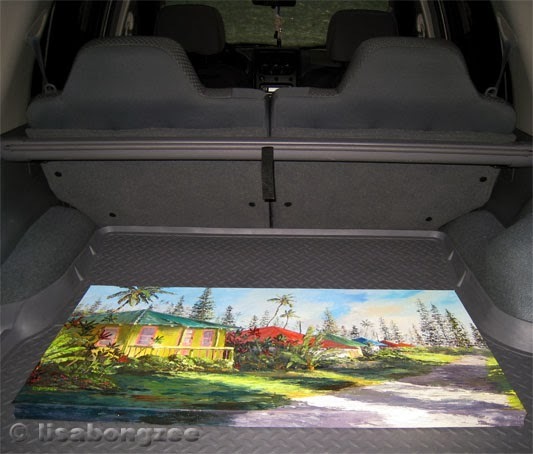 Going out for groceries is not an option, and if I decide to paint any larger, I will have to trade my Xterra in for a VW Bus! But the smell of fresh wet oil paint does make a yummy car air freshener! 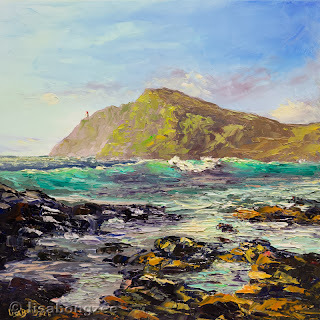 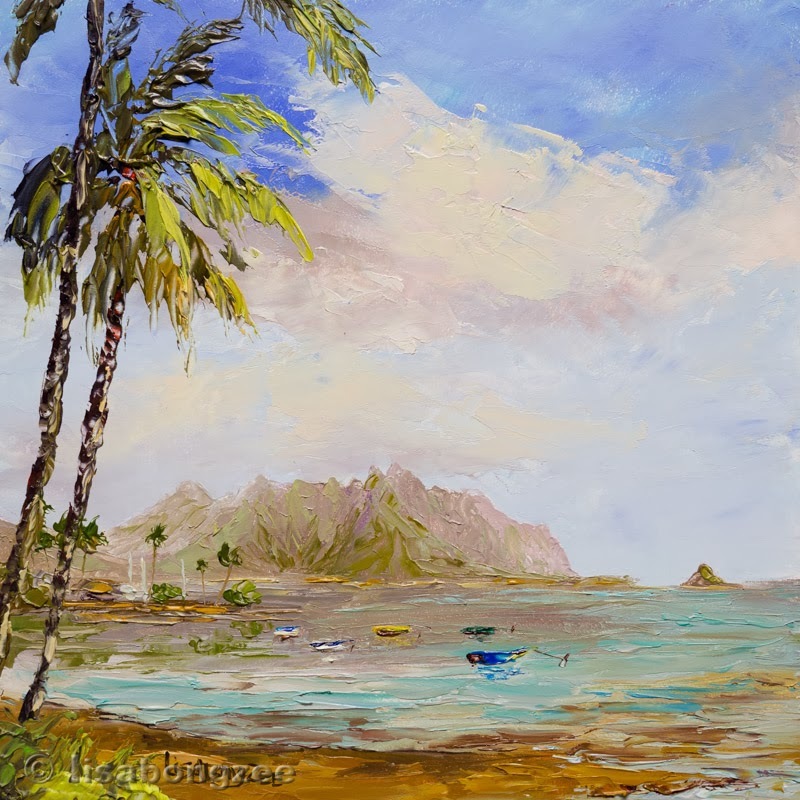 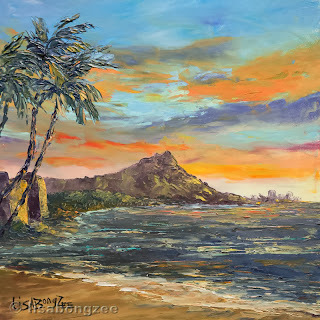 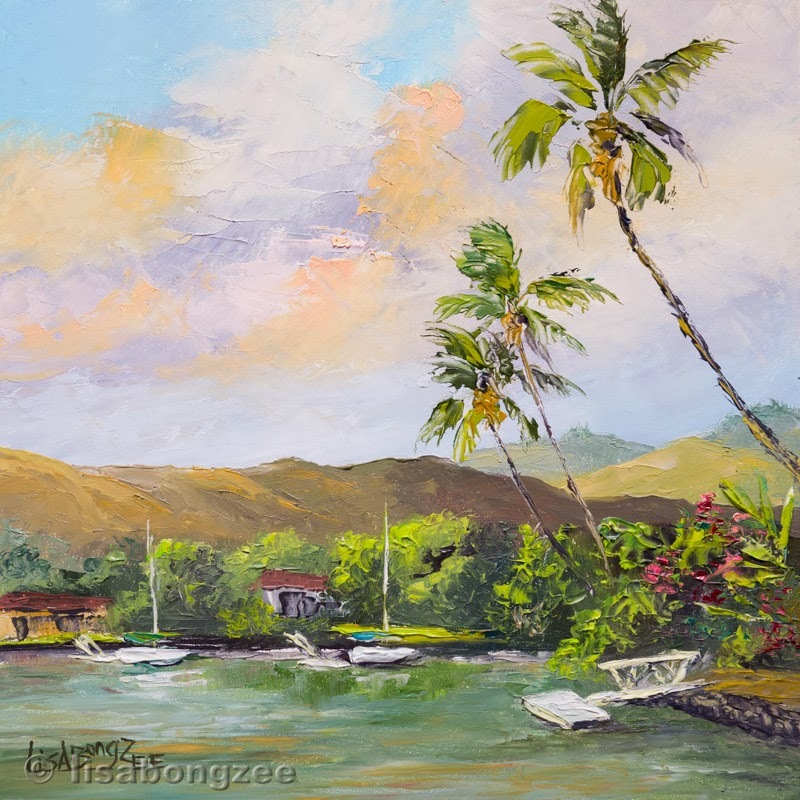 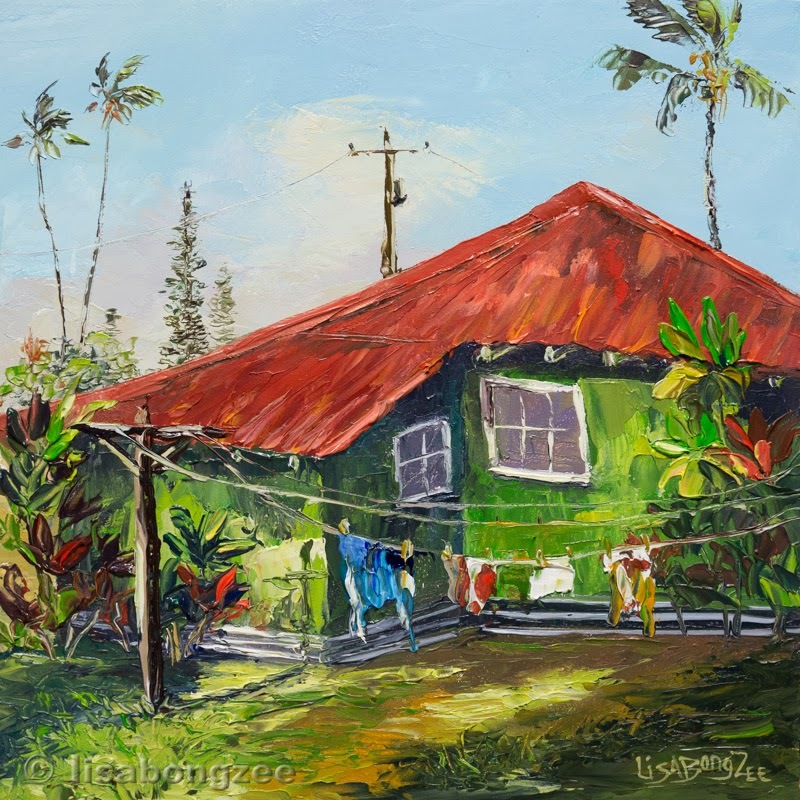 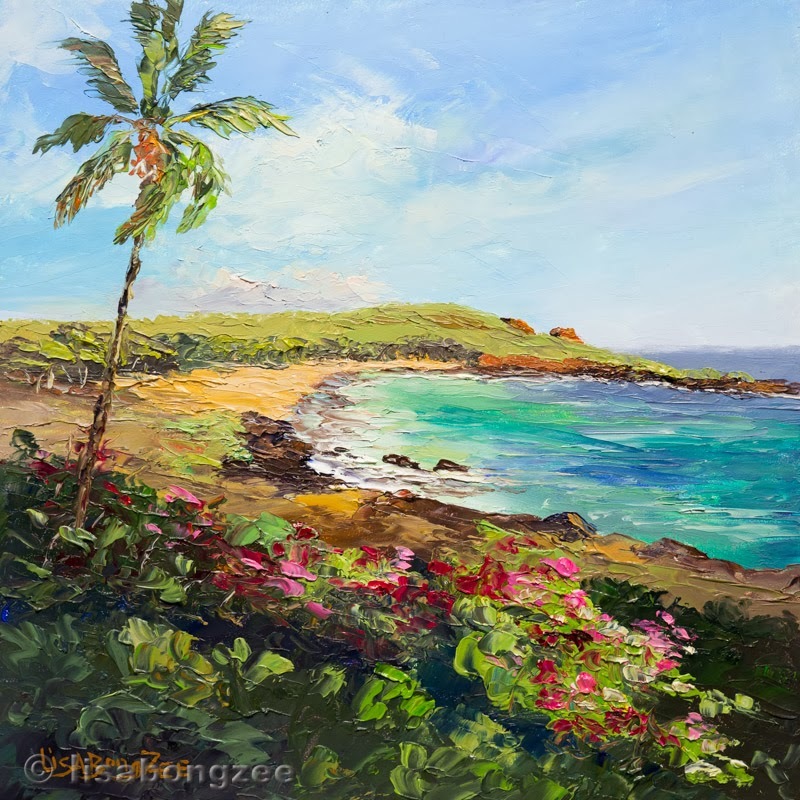 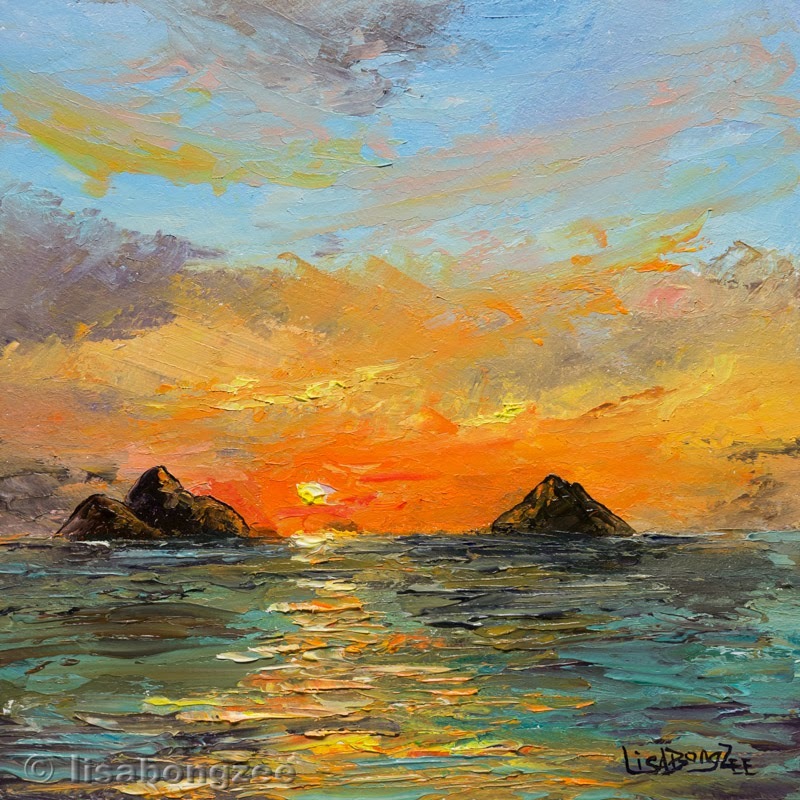 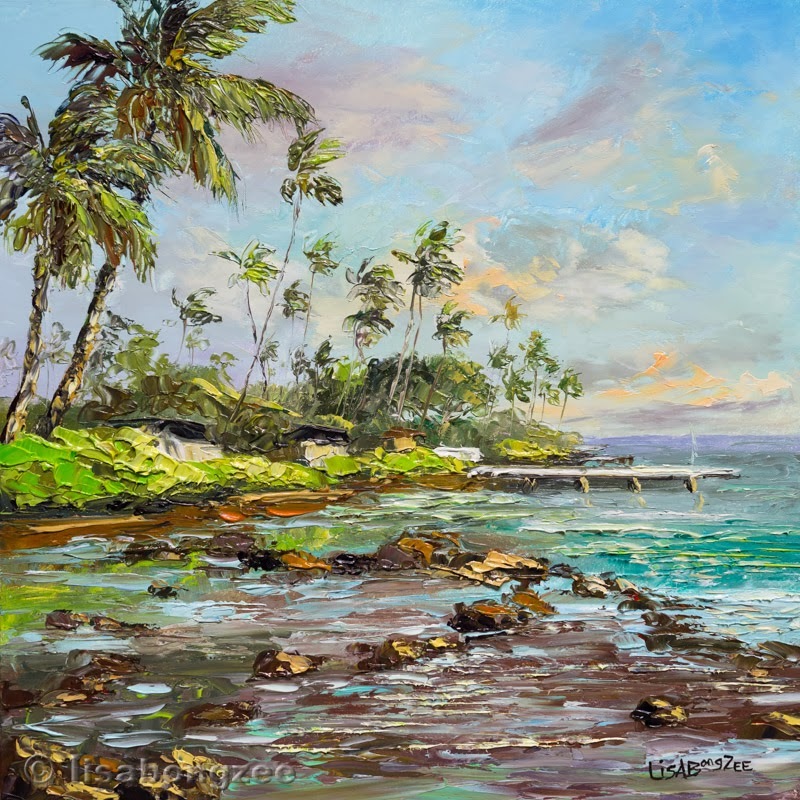 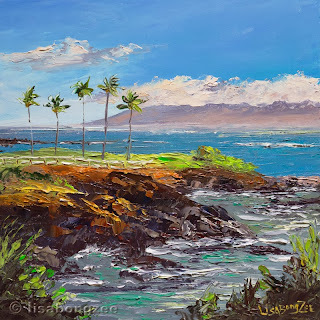 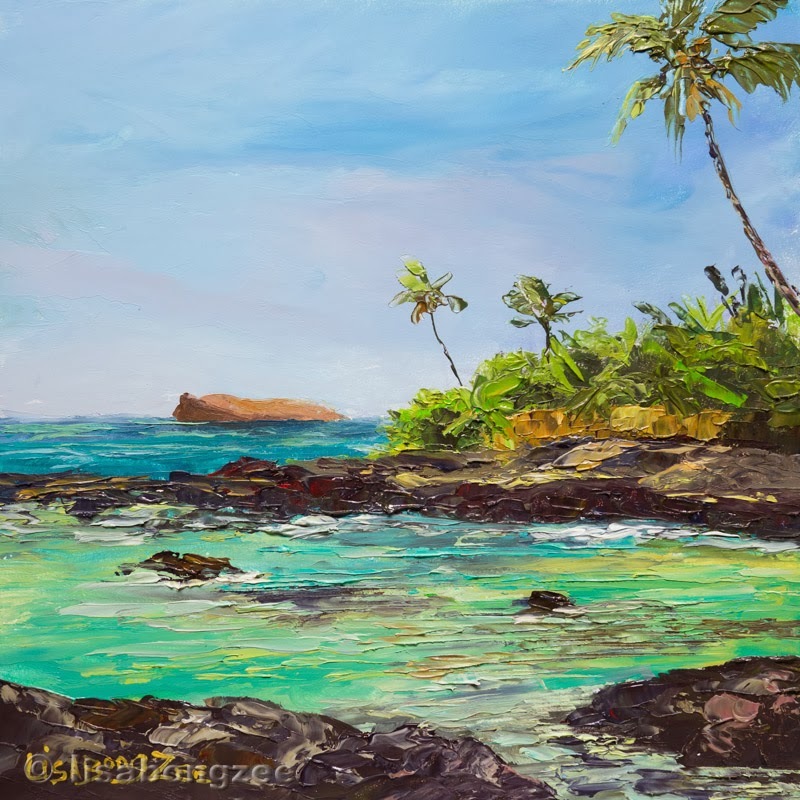 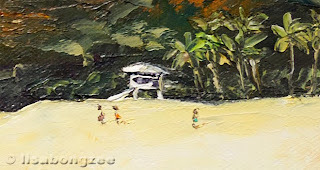 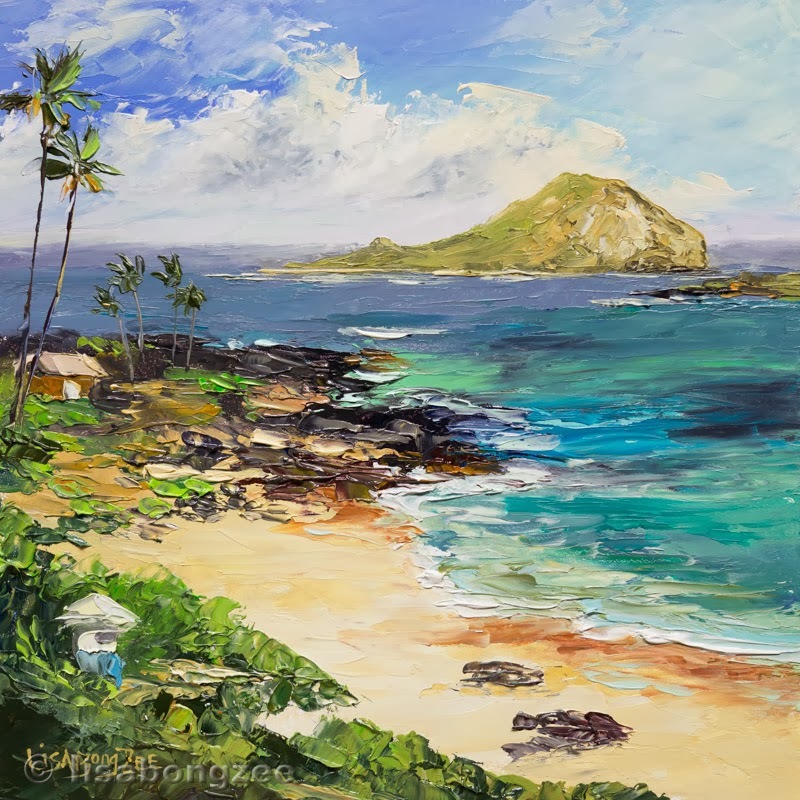 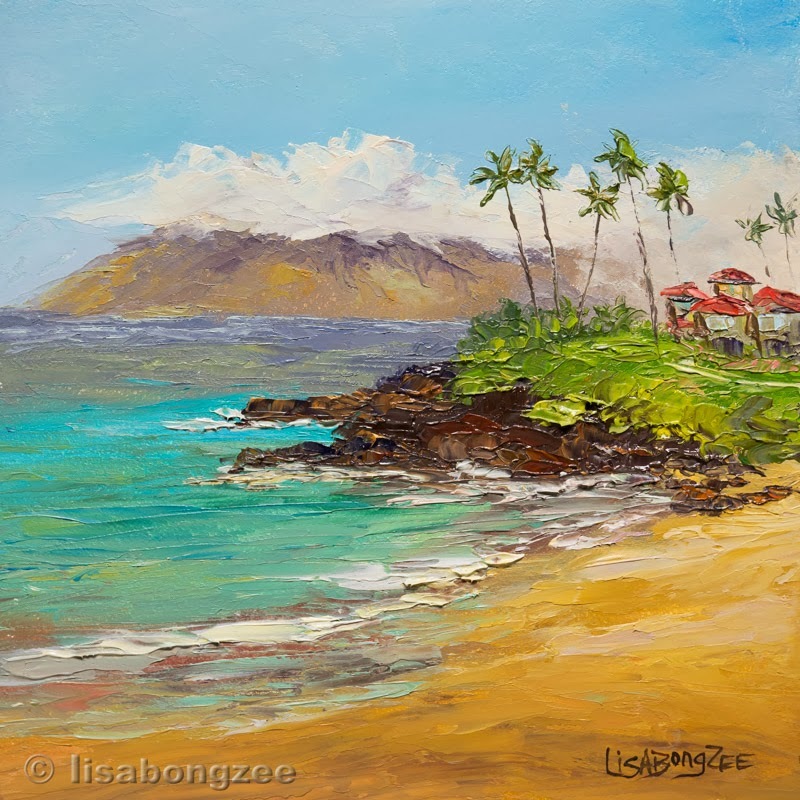 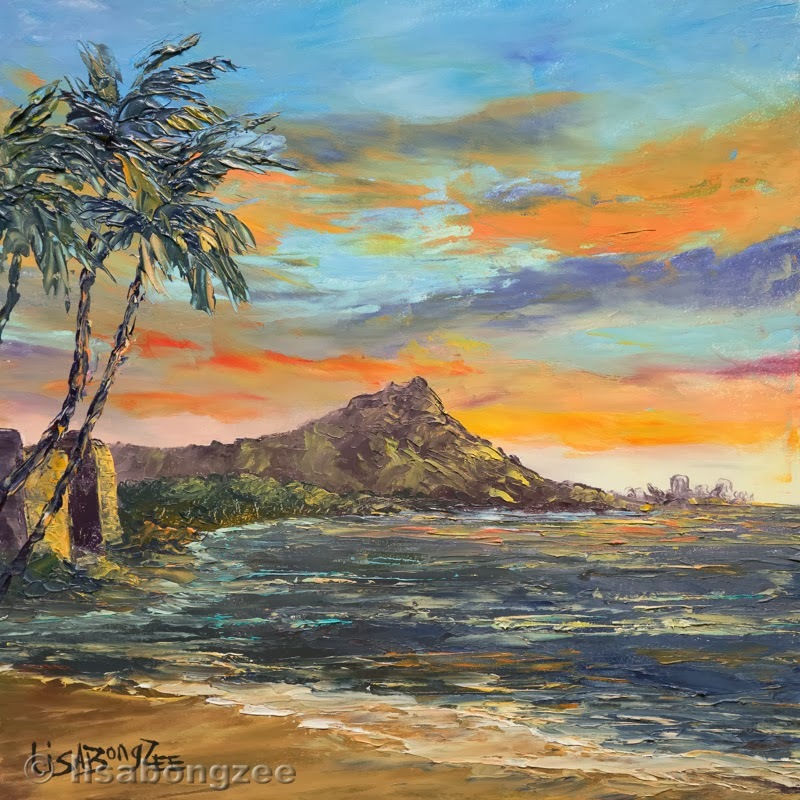 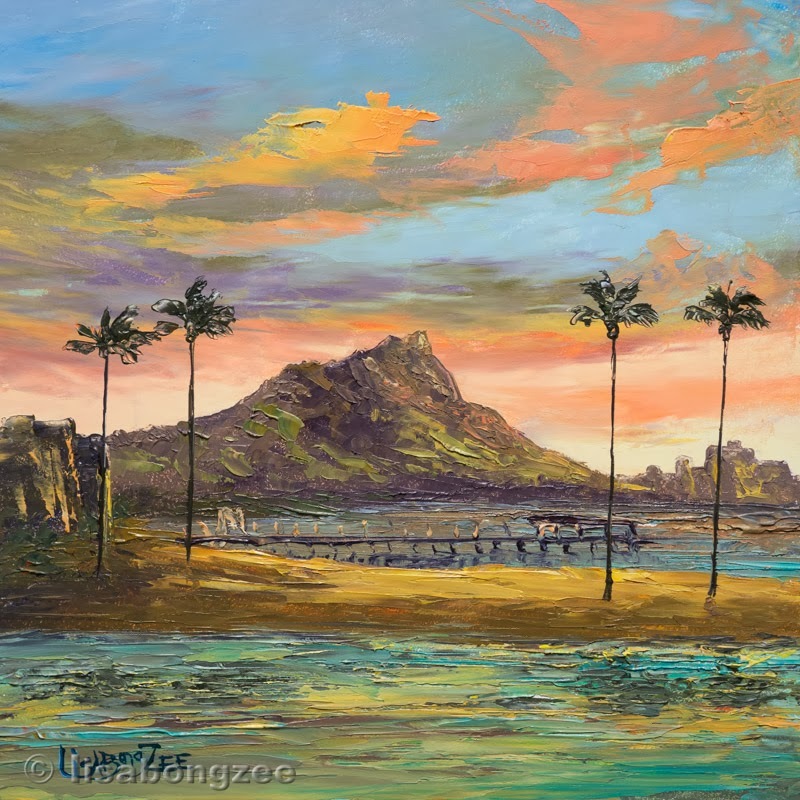 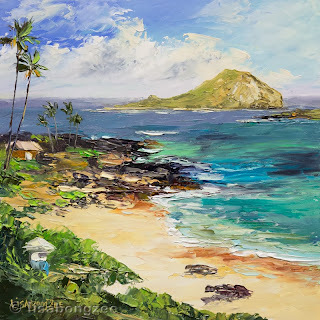 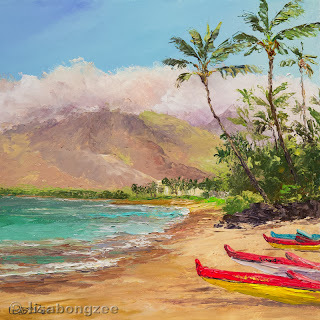 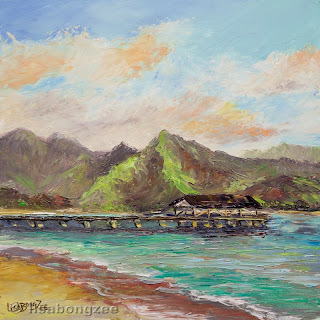 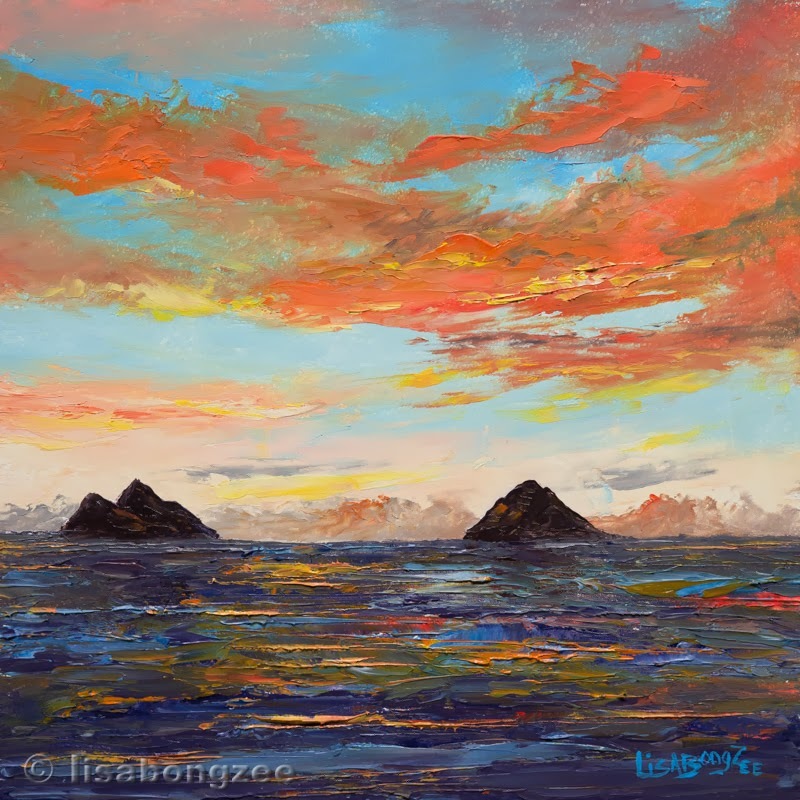 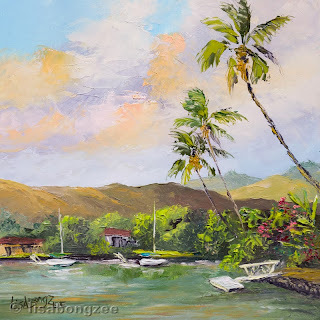 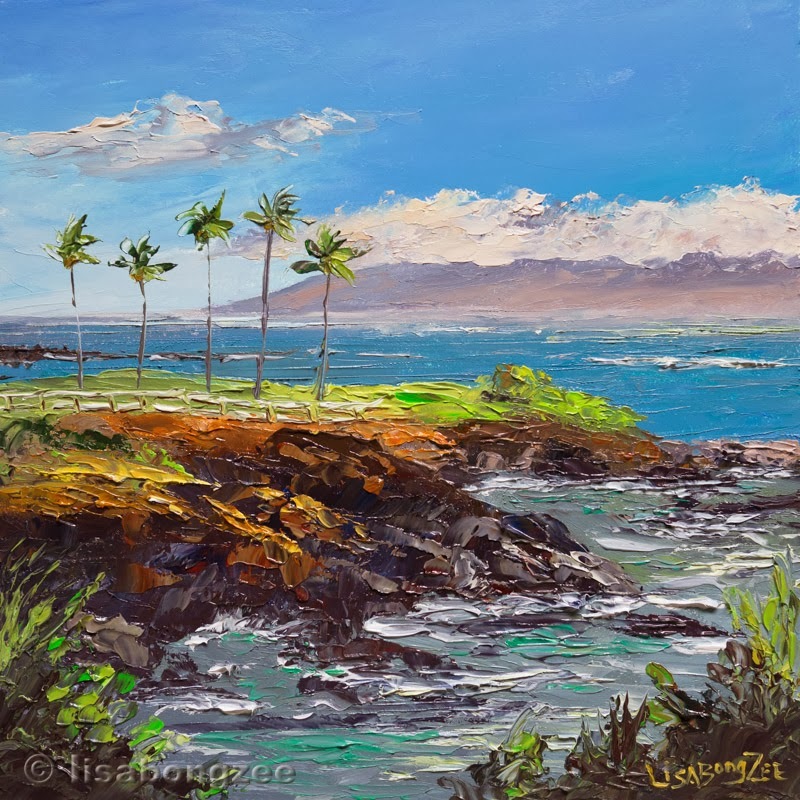 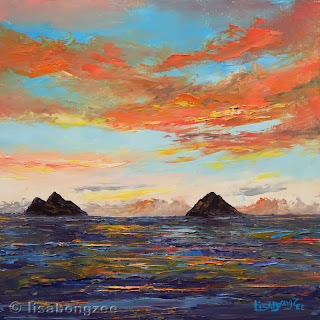 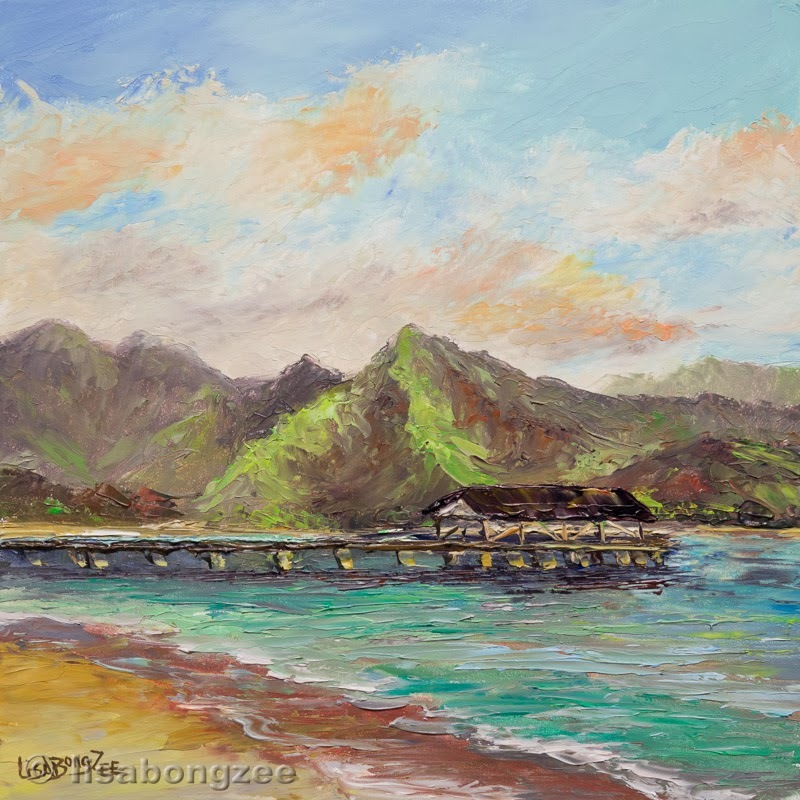 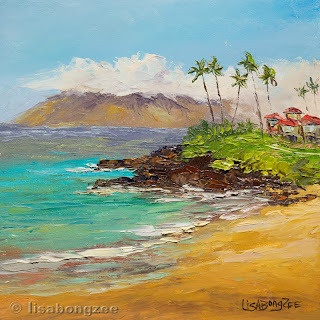 A few more of my latest “Mini Hawaii” original palette knife paintings. Here are a few more of my latest palette knife paintings. These are larger than my “Mini Hawaii’s”, but still just as much fun to paint! They measure 8”x8” and come framed in solid wood.